Since the turmoil started in Feb. 2012 with the resignation of former Kancho Henk Kuipers was I in shock and disbelieve. Now it starting to come together again and I feel happy again. The International Budokai Kan from Jon Bluming came out even stronger and the loyalty to me was overwhelming and from the bottom of my Budo heart, I thank you all. There is a kind of rumor that I don’t like or even hate Henk Kuipers? Noting is less true! I thank Henk for all the terrific work he has done in the first 4 years for the Budokai for that was a lot of work and he did it with love. What happened after that is a few events nobody would have thought possible. First he lost almost everything to a dispute with the Dutch tax people and then he told me that he was in trouble with a motor club in Amsterdam and joined after that the opponents of that motor club the Satudarah. So he got more trouble than a normal man can take. After a TV debate with him in full attire of the Satudarah and full in view everybody knew what was happening. Henk resigned and told me he was making his own thing. Everybody must do what he wants to do of course in a legal way. So I wish Henk a long and happy life and again thanks for the great help before. 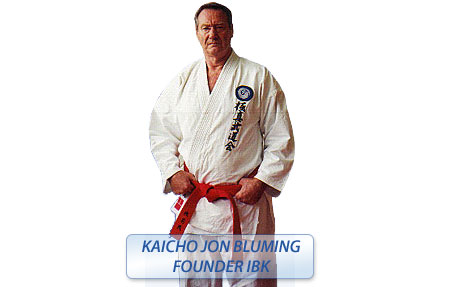 I was supposed to write the rest of the history of the IBK, Jon Bluming the Kyokushin Budokaikan. But I won’t for it is water under the bridge and not important. Just read what is written before under history at both websites and you will understand why I founded the Kyokushin Budokai kan.
After 32 years it has become real mature and everyone involved should and must work together with other organizations to have pleasure and fun with Budo and I am sure that you will get as much a happy Budo life as I have had for it gave me a purpose in life some with downs and mostly ups and I love my Budoka who are always helping me. Now that I am close to getting 80 years of age I look back at a terrific life with highlights the three and a half years in Japan at the top. Lately I think much about that time and I really miss my teachers and advisors like Don Dreager, Oyama, Kenji Kurosaki, Ichitaro Kuroda, Daigo, Osawa, Big Suk, Choi In do, Isao Inokuma and realize also what a lucky sob I am having all those fabulous teachers who gave me my Budo life. I terribly miss them. My family ... work together teach each other, make championships and summer camps and winter camps don’t wait for anybody else. We will as long as I live, not have again a structure like a Kancho or Fuku Kancho, ect, ect, prestige names who walk with their thumbs in their belt and their fat belly forwards from those you usually don’t learn anything but visit each other with events made by you all.